Are you taking your dog to work tomorrow? Friday, June 24th is Take Your Dog to Work Day. Will you get to? If so, here’s a great article for you. Ten things to remember for Take Your Dog to Work Day. Owning and running a boarding kennel is TYDtW day every day, but it’s not all puppies and play. We try to stay up to date on as much of the pet news for products, training and health as we can, which means I follow about a dozen or more blogs every week, many not listed in my blogroll to the right. I’d like to start sharing some of the more interesting articles I run across with you, too. Ticks, Lyme Disease and Essential Oils – This one really hit home with us. 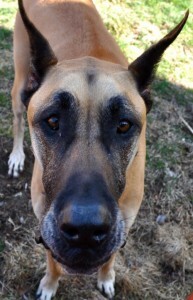 Dagobaz, our beloved fawn Great Dane with Wobblers syndrome, was diagnosed with Lyme’s disease over Memorial Weekend. I felt it was a rotten way to be fully integrated into the Wisconsin lifestyle, but thankfully, he’s recovering and even getting used to taking 13 antibiotic pills a day. "Dag"obaz is our sentinel and communicator for the pack. Pet Aromatherapy and Essential Oils: What you need to know. Dr. Richard Palmquist is an integrative vet (one who practices both traditional western and alternative vet care) wrote this very informative article. It is well known that I am believer in the power of essential oils and flower essences, and if you’ve ever wondered what it’s all about, this article is the one for you. Leptospirosis in Dogs – This is a disease I didn’t know anything about until I became vet coordinator for the great dane rescue. It is a killer bacteria and is contagious to both dogs and humans, making it one of the few dog diseases to cross the species line. This article addresses some homeopathic ways of treating Lepto.